I threw together this broccoli salad with pasta one night having no idea just how good it was going to be. It's really a wonderful recipe that you can adjust to your own taste. If you don't like onions, don't put any onions in it. If you like bell peppers, add them. If you like more broccoli, then add more broccoli. You can make this pasta salad recipe your own. Cook the pasta according to package directions but just until tender, don't overcook it or it will be mushy. Drain. Place in a large bowl. Add the peas to the warm pasta and toss. Add all of the other salad ingredients. Toss. Set aside. In a smaller bowl, or a container with a tight fitting lid, combine all the dressing ingredients and mix well (if you use a container with a tight fitting lid, just shake). Add to the pasta and toss to coat. This is best if you refrigerate it at least a couple of hours to give the pasta time to soak up the dressing. 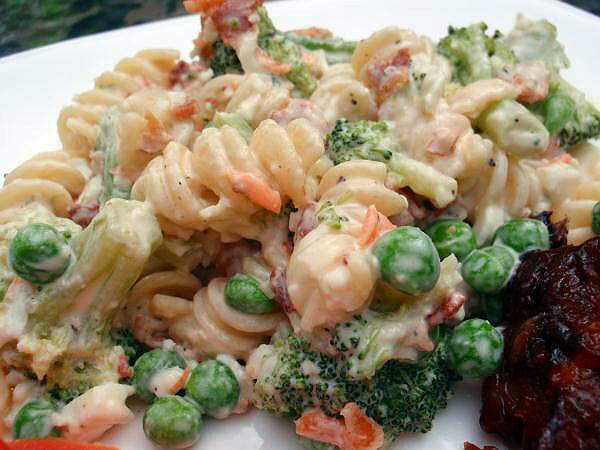 I hope that you enjoy this broccoli pasta salad as much as we did!